Sound View Electronics manufactures and installs escalator announcement systems. We provide automatic announcement systems for escalators and moving walkways for the following businesses: Subway, Train and Bus Stations, Arenas, Hotels, Amusement Parks, Department Stores, Malls, Casinos and Airports. Our systems have four primary functions: Safety, Informational, Instructional and Advertising. The automatic messaging systems can continually run in a loop or be activated by detecting the motion of a rider. Our messaging systems are the only escalator announcement systems approved for use in the NYC Subway system. Some of the reasons our automated messaging systems are chosen are their superb sound quality, the ability to change messages, our vandal proof yet attractive designs and our easy to install components that fit into existing escalators. Each system has six different speaker options, four amplification designs and four types of messaging options. When it comes to escalator safety or modernization, Sound View Electronics announcement systems can bring your escalators to their full potential. Escalator safety messages are continuously broadcast to escalator riders, reducing accidents and the risk of lawsuits. Multiple language messaging allows quality communication to diverse populations. Messages that direct riders can speed the flow of traffic thereby increasing the quality of the customer’s experience. Advertising messages can announce specials, drive traffic to stores, to specific merchandise or to departments within a department store. 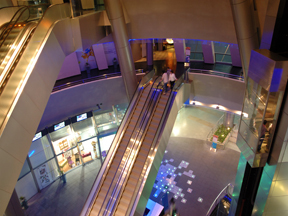 Advertising messages can turn escalators into profit centers. Our quality audible announcements are optimized for clarity and understanding. Vandal proof enclosures are built to withstand dirt, grime and abuse. Flexible mounting options allow you to maximize sound quality and aesthetics. Durable yet attractive design can withstand the abuse public announcement systems must stand up to while offering unobtrusive, attractive speaker options.